"Have a Merry and Most wonderful Holiday Season!" "Wishing you a souper Holiday Season!!" "Warm up to a wonderful Holiday Season topped with Christmas cheer!" "Hoping you have a ball this Holiday Season!" We're rooting for you to have a Happy Holiday Season and a Wonderful New Year! so be good for goodness sake!! Merry Christmas!! We WHISK you a Merry KISSmas! We tray-sure your friendship! Merry Christmas!! May this sweet scent bring back thoughts of warm Christmases long ago! Merry Christmas! You add sparkle and make our life brighter! Merry Christmas! You're dust the finest neighbors we know! Merry Christmas! Wishing you Joy Beyond Measure! May your Christmas be sprinkled with laughter and love! Merry Christmas! Add a little spice to your Holidays! Merry Christmas! Keep Christmas in your heart the whole year through! Just popping by with a Holiday Hi! May your New Year be Festive and Fruitful! Wishing you a season filled with sweetness! Orange you glad we're Friends? Merry Christmas! Orange you glad it's Christmas? Hope your Christmas is a sweet one! May your Christmas be Merry and Sprite! Don't Snicker, just be glad you got something! No one matches you as neighbors! Merry Christmas! We couldn't restrain ourselves from wishing you a very Merry Christmas! May your holidays bubble over with fun! Merry Christmas from our pad to yours! Merry Christmas to a noteworthy friend! To a grate Neighbor! Merry Christmas!" Have an udderly moovalous Christmas! We wanted to give you something so you weren't getting muffin for Christmas! Have a Pasta-tively Happy Holiday! Just a Holiday Hi and a tasty Pie! Happy Holidays! Fudge a little on the calories and enjoy the Holiday Season! Banana Bread just for you, because you have so much to do. We love you a whole bunch! Merry Christmas!" Here's a sweet treat rolled up with warm Holiday Wishes! Merry Christmas! Just like you, friend it's tried and true, just for you! Happy Holiday Baking or Merry Christmas Cooking! Hope your Holiday has a touch of Pizza - z! Merry Christmas! P.S. Don't forget that you can add a personal note to make it meaningful. This is a fun idea with endless possibilities. You can turn a piece of scrap wood into a fun, rustic sign. Paint the sign, trace some printed letters (or fins letters at Michael's), paint the letters with an angled paint brush (to get a nice edge on your letters), and then use a power sander to distress some parts more than others. Keep your eye out for some wood! If you don't sew than this great gift idea is for you! 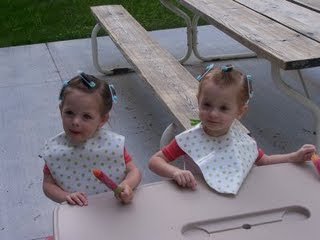 These cute bibs are made out of oilcloth. Just trace the shape of a bib that you like on the back of the oilcloth and cut it out. Then holes were punched out on both pieces that go around the neck and a piece of ribbon tied to each hole. There are some really cute prints that I have seen. Oilcloth is waterproof so it would be great for a tablecloth too. 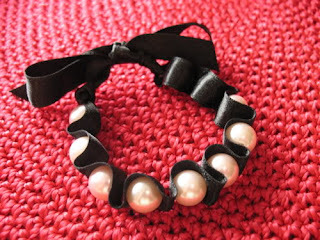 You can easily make this fun bracelet with this great tutorial here. Or you could buy it for $890.00. I love this! All you need is fake pearls (these are from an old necklace), embroidery thread, a needle, and some ribbon. with this. I found this great idea here. This cake stand is made with thrift store items: a candlestick spray painted and a plate. 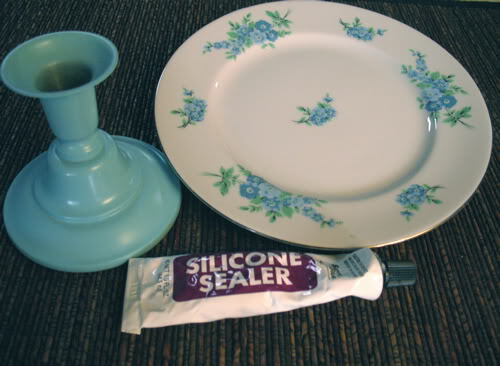 Put some E6000 glue or silicone sealer around the top of the candlestick and then glue it to the center of the bottom of the plate. 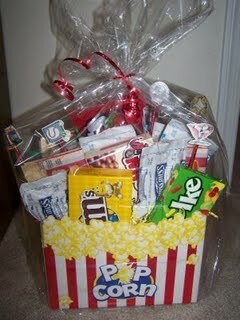 Give the gift of a fun family movie night or date night with this movie gift basket found here. I have seen movie popcorn boxes at the dollar store. Use floral foam or Styrofoam to stick your skewers into and then attach the items to your skewers (she used hot glue) and stick in the foam. Items to include could be: popcorn, movie candy, and hot chocolate. 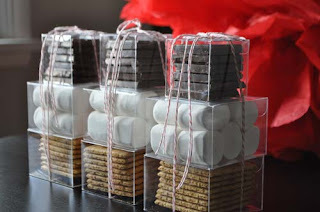 I absolutely love this cute gift idea: s'more kits found here. You could do these any way you like. These particular clear boxes can be found at any packaging store or site and you can buy in bulk and save big (either go in on a bunch with some friends or save them for your own gifts). Here is a sight I found that seemed pretty reasonable to me. You don't have to package it this way though. You could come up with your own fun way to present a s'mores kit (and then share it with me!) What a fun gift for a family to get! I always love gifts that give us something fun to do together. 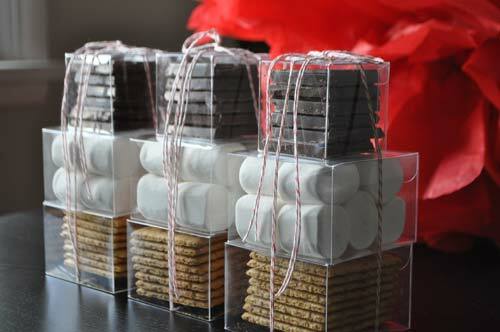 Or what about a miniature s'more kit for an individual? oooh. 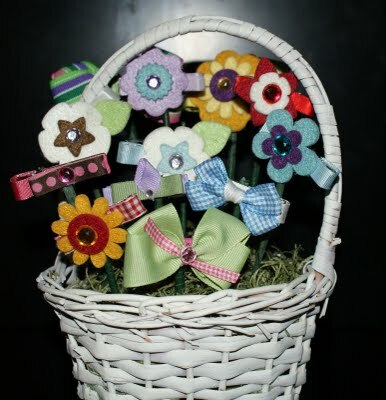 These cute candy bouquets were found here. 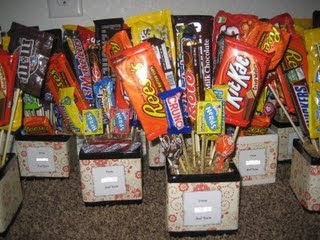 Make sure you have a heavy base that won't tip, something to put the sticks into (like Styrofoam or floral foam), shredded paper or moss to cover the foam, bamboo sticks or skewers, and something sturdy to attach the candy to the sticks (like heavy duty tape or hot glue). This is a great gift for anyone who loves candy. 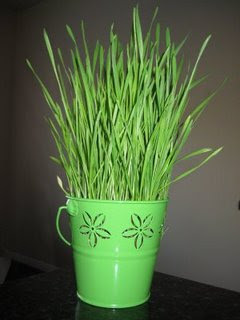 All you need is potting soil, a container, and some wheat grass seeds to give the gift of SpRinG. Just fill your container 3/4 full with potting soil, then sprinkle a thin layer of seeds, and add a thin layer (1/4"-1/2") of soil. Then water it! The picture above came from here. I have done this for my Visiting Teaching ladies before for Easter. I grew the grass in a spring basket a few weeks before Easter and then delivered their basket with some Easter eggs filled with treats set in the grass. This would be a fun way to deliver any Spring/Easter treat or gift. Kids would love it too! Hair bows are a great gift for any girl. If you want a unique way to package it try a bow bouquet. Get a basket or other container and put a Styrofoam block or a green floral foam block then cover with Spanish moss. Then cover wood skewers (or some other kind of stick) with floral tape and clip the bows to the skewer. Then stick your skewers into the block at varying heights. This idea was found here along with tutorials on how to make bows here and here. And if you are looking for a GREAT price on alligator clips, bows, flowers, and other accessories then go to haloheaven (as long as you don't mind buying in bulk - I went in on an order with some friends and it ended up being 50 cents per flower/clip including shipping). These packages were wrapped in Japanese newspaper. Then wrapped with a strip of Japanese paper and tied with string. Next time you are looking for a new way to wrap a gift (especially if the gift isn't from the U.S.) try buying a newspaper in a different language. This idea was found here. 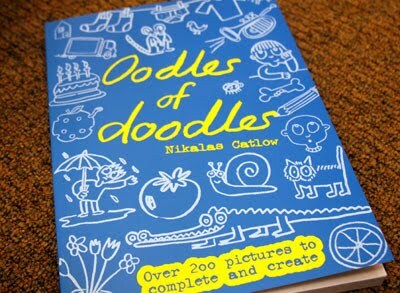 This is a doodle book. 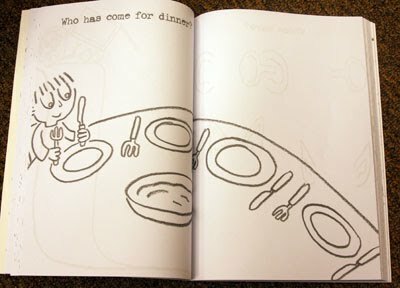 A coloring book where you get to complete the pictures. Check it out here to find out how to get your own. OR make your own coloring book. Make your own simple doodles and leave a little room for a child's imagination to finish it. Create Your Own Pop Top Treat! Save your pop top cans! 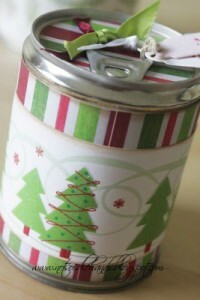 These cute little treat cans were found here with a great tutorial here. Don't pop the top on your grocery cans. 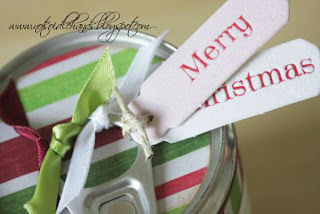 Instead, use a can opener to open the BOTTOM of the can and empty the contents and clean out the inside (make sure the bottom of the can is flat and not rounded so that you can actually open it with a can opener). Then, fill it with a treat and glue the bottom back on with hot glue or E6000. The lucky recipient gets to pop the top to find your special treat. Totally cool! 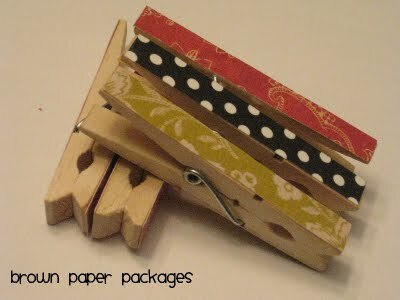 Clothespins are a cheap and easy thing to dress up. You can find a package of 30 at the dollar store. These cute clothespins were found here with a tutorial too. They are just mod podged with some scrapbook paper. Use these to dress up any gift wrap job and add a magnet on the back to make it even more useful to your recipient (great addition to a magnet board gift!). Consider adding other things to the clip like ribbon, buttons, or flowers too. 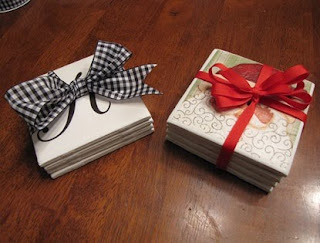 These coasters from here are made with printed paper and napkins! She gives a great tutorial too. 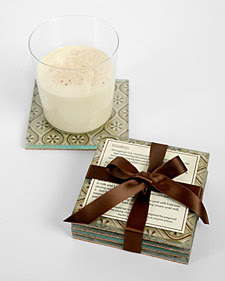 I would never think to use Santa napkins or print something from my printer and mod podge it onto a coaster. And the tiles are so cheap too. She used white tiles for these. Just make sure you spray the top of the tile with acrylic sealer after the mod podge is totally dry to protect your design. 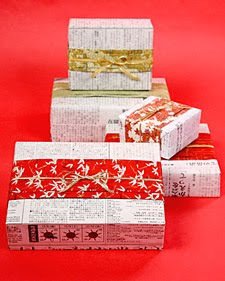 You could also try using gift wrap too! 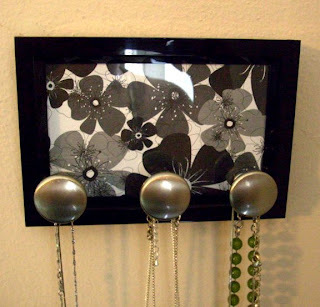 All you need for this project is a frame (this one came from the dollar store), some knobs (these came from an old dresser), some scrapbook paper, and E-6000 glue. I found this idea here. This would also be a great idea for stretchy or crochet headbands. 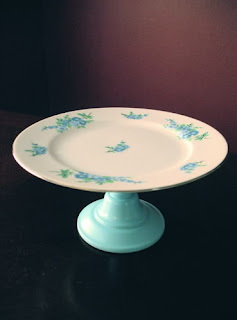 This would also be a great addition to a gift of homemade jewelry. This could easily be a free gift. Here is a great alternative to vinyl if you are looking for a nice, clean look. I found the idea here (great tutorial) via here. Basically you type out anything you want and then open your image in Sumo Paint (a free download) and flip the image and print it out. Then tape the image face down on the front of the window or glass exactly where you want it. 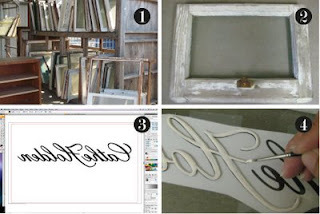 Flip the glass over and paint the letters with acrylic paint. In the free section of Craigslist and also on freecycle you can look for vintage windows and glass pieces that won't cost you anything! I would love to see what you come up with. Email me your pictures if you do this gift idea. There is a great tutorial here for how to make a puzzle out of a photo or your own art. The picture was sized and printed in a Word document and mod podged to a piece of cereal box cardboard. Then add a layer of mod podge on top of the picture. A piece of patterned paper was mod podged to the back of the cardboard. After it is dry, trace puzzle pieces with a fine tip sharpie marker and then cut them out with an x-acto knife. You could personalize this for any child, any age. It would be great to give a set of personalized puzzles as a classroom set for a teacher too (maybe with scenes of the city or state). 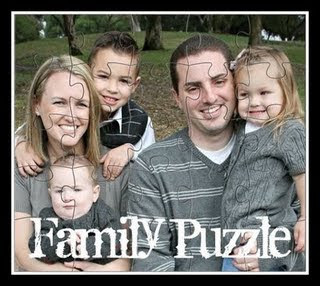 Also, consider putting another picture on the back of the puzzle instead of scrapbook paper. Then you have 2 puzzles in one! Put a few tablespoons of this in your bath to make your skin soft and yummy smelling. I also used a little to wash my hands and it was wonderful. Here's how to make this gift. Before mixing, pour the salt into the container that is going to be used and then dump it into the mixing bowl. This helps with not getting too much or too little salt to fill up the container. Remember to leave space to close the lid. Once you have the right amount of salt measure it and then add half of that measurement of Sunflower or Vitamin E oil. Example: 2 cups of salt and 1 cup of oil. Then mix the salt with the oil for a few minutes in a bowl. Add the scent. For this cucumber melon jar pictured above 8 drops were put in to start, but then 6 more drops were added to give it a stronger smell. It really depends on your taste and the intensity of the scent you are using. Mix for a few minutes. Then add food coloring. Since a light green color was desired for the cucumber melon about a 1/2 of a drop was used. (A whole drop was put in and then half of it was scooped out with a spoon). If you want to make a color by mixing the food coloring try mixing it first and then add it to the salt. The colors didn't seem to blend well with the salt and oil, maybe because the coloring is water based. You could try printing your own design label with the name of the scent and directions for use. and attach it to the container. Bath salt are not recommended for pregnant women or children. Thanks to Ali for the picture and Hollie for the idea. Ali suggested buying reusable grocery bags for $1 each and giving them as a gift. She has been collecting these cute patterned bags to give a bundle to her sister-in-law for Christmas. If you want to do the FHE Lesson gift idea and are looking for some ideas for FHE lessons go here for a whole bunch of links to sites where you can get materials and ideas. 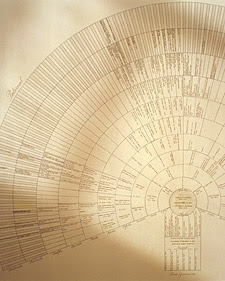 I found a beautiful family tree template here. Go here to get this template and take it to a copy store to get it enlarged. Fill out as many names as you can and give it to a family member to display in their home. Family names can be added to it through the years.